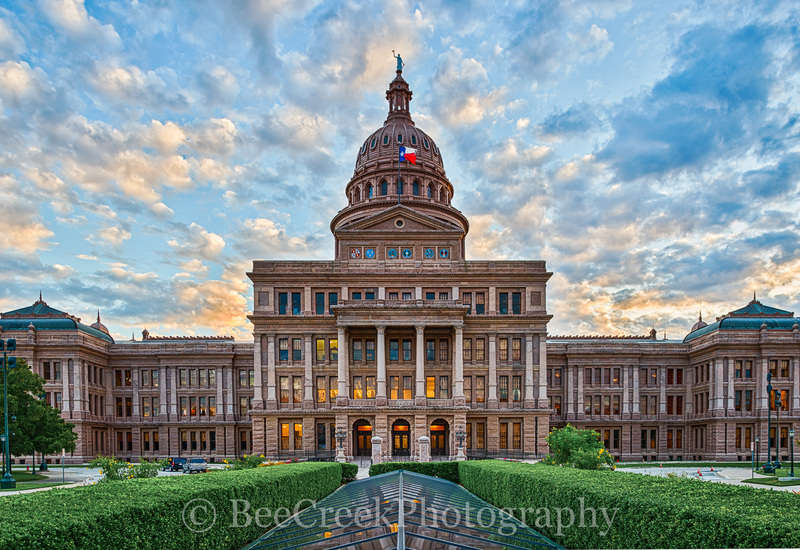 Texas Capital in Downtown Austin at Dusk – View of the Texas Capital in Austin looking south at dusk with the sun going down behind the clouds which are back lit from the underside making for an impressive sky in downtown. The Texas Capital is visited by thousand of tourist every year and it is one of the top tourist attractions in Austin it is an iconic historical site. Texas State Capitol, completed in 1888 in Downtown Austin, contains the offices and chambers of the Texas Legislature and the Office of the Governor. The Capital building was built in 1888 of granite in the italian renaissance style and it is consider an historic landmark. Probably one of the top destination in the city for toursit and locals alike. Posted in Photo of the Day and tagged Austin, austin landscapes, austin places to see, austin texas, buildings, Capital, Capital of Texas, Capitol, city, downtown, fine art, historic, iconic, images for Austin, images for Texas Capital, images of austin, images of capital of texas, images of places to see, images of texas, images of texas capitol, landmark, photo, photo of texas, photos, photos of austin, photos of capital of texas, photos of places to see, photos of texas capitol, pictures of austin, pictures of capitol of texas, pictures of places to see, pictures of texas, pictures of texas capital, State Capital, stock photos, stock photos of Austin, texas, texas capital, texas images, texas landscape, texas photos, texas pictures, texas politics, Texas State Capital, texas stuff on October 28, 2017 September 25, 2018 by Bee Creek Photo. Captured the Alamo in San Antonio around dusk where there was a brief moment of no one in front of it for this cityscape. The Alamo was originally known as Misión San Antonio de Valero and was founded as a Catholic mission in 18th century as a mission and fortress compound along with educational purpose for the American Indian. Today is is part of the San Antonio Missions World Heritage Site in San Antonio, Texas. This historic landmark site is part of the San antonio cityscape which draws thousand of tourist year round to come to the mission and discover the historic significance of this place. The Alamo is treated with a lot of reverence so be respectful when inside at all times. Today it is part of San Antonio greatest toursit attraction because of it contribution to history. During the revolution a small number of Texians were at the compound when the Mexican Army attacked and kill most who were left inside and burned some of the place down. Many know the history of Battle of the Alamo as William Travis and his men like Daniel Boon and Jim Bowie fought Santa Anna Army. The Alamo was brought back to life when the Daughter of the Republic in 1835 started trying to preserve it and had maintained until 2015 when the Texas Land Office took over the site. Today it is probably one of the most popular tourist spots in the state of Texas. Another image of the Alamo in San Antonio around dusk where there was a brief moment ot no one in front of it. This is landmark part of the cttyscape of S A and it draws thousand of tourist year round to come to the mission and discover the historic significance of this place. It is treated with a lot of reverence so respect must be shown when inside at all times. 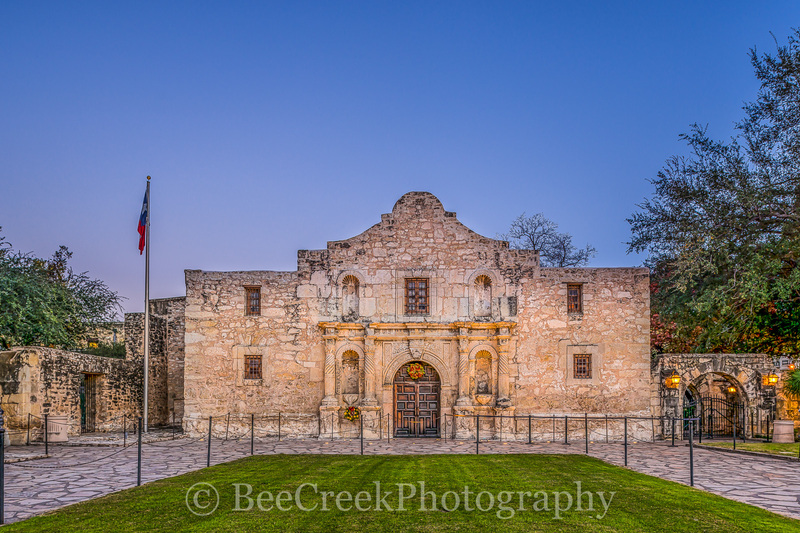 Posted in Photo of the Day and tagged Alamo, Battle of the Alamo, Daniel Boon, historic, Jim Bowie, landmark, mission, Revolution, San Anotnio cityscape, San Antonio Alamo on October 24, 2017 October 24, 2017 by Bee Creek Photo. 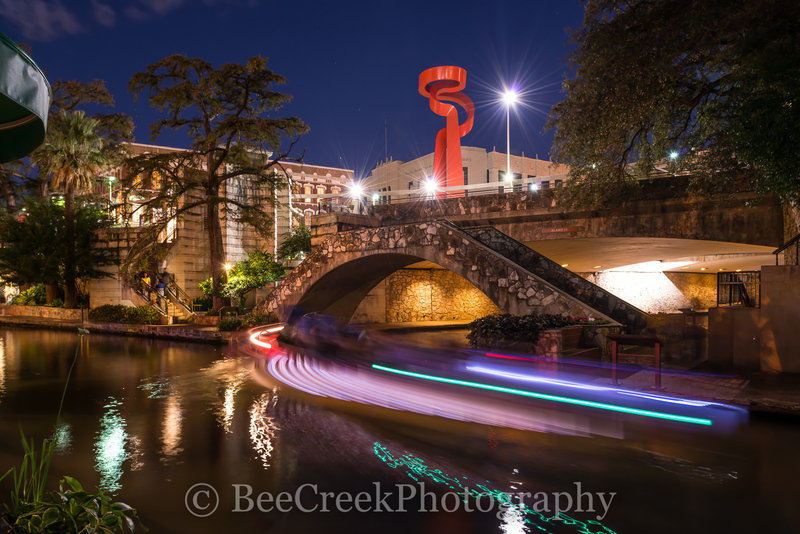 The San Antonio Torch of Friendship at night stands tall along the river walk from the road above in this cityscape image. This Torch of Freedom sculpture was created and erected in 2002 by a world famous scupture Sebastián. La Antorcha de la Amistad which is “Spanish for “The Torch of Friendship”. The Torch of Freedom is a unique abstract sculpture art work which stand at 65 feet high along the riverwalk and at night it can be seen from the San Antonio riverwalk below like a beacon. We like this angle as the riverboats criss crossed under the bridge they left this colorful trail of light on top of the water from the long exposure from the river walk below. The San Antonio river walk is probaby the biggest attraction for the city, for tourist and locals alike, on any given day but especially on weekends night the crowds swell sometimes making it almost impossible to walk, but the festive mood will keep you coming back. Posted in Photo of the Day and tagged San Antonio, San Antonio cityscape, San Antonio river walk, Torch of Freedom on October 23, 2017 October 24, 2017 by Bee Creek Photo. We capture this image of the Austin skyline with Stevie Ray Vaughn statue from the hike and bike trail on Ladybird Lake with the latest high-rise editions to the city the Colorado Towers, which now almost completely block the Frost building from view at this location. This area of the hike and bike trail along Ladybird lake has been a favorite location for many to capture the city and the statue together. We had an exceptional day with nice skies so we decided to try and capture this photos again, but with the ever changing skyline we will be back again soon. Stevie Vaughn was a favorite blues and rock roll singer who died from a helicopter that crashed into the side of mountain in 1990 at the early age of 35 in the height of his carree. Stevie played a lot of concerts along auditorium shores along with many Austin clubs so this statue was put along the hike and bike trail along Lady Bird Lake or Town Lake as it was called back as a memorial to him in 1994. Today this site is a favorite of tourist to visit and photograph. 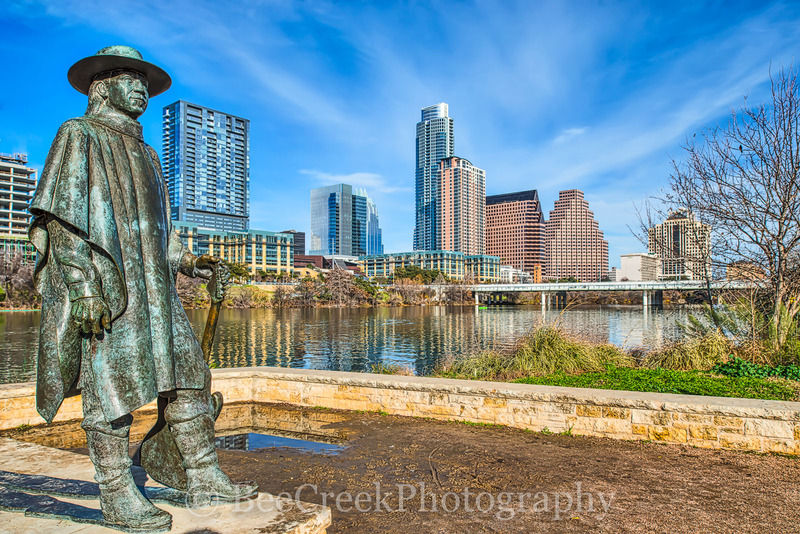 Stevie Ray Vaughn Austin – We capture this image of Stevie Ray Vaughn statue from the hike and bike trail on Ladybird Lake with the latest high-rise editions to the Austin skyline the Colorado Towers, which now almost completely block the Frost building from view at this location. This area of the hike and bike trail along Ladybird lake has been a favorite location for many to capture the city and the statue together. We had an exceptional day with nice skies so we decided to try and capture this photos again, but with the ever changing skyline we will be back again soon. Posted in Photo of the Day and tagged austin cityscape, Austin downtown, Austin skyline, blues, clubs, Lady Bird Lake, rock and roll, Stevie Ray Vaughn, town lake on October 22, 2017 September 25, 2018 by Bee Creek Photo. Austin Skyline Reflection Night – There is something magical about the Austin skyline at night. In this image you see the high rise buildings as they reflected back into this pool of water after dark from the Palmer/Long Center in downtown Austin. The Austin Skyline has been constantly changing in the last few year but you can still see some of the iconic building like the Frost Bank building, the Austonian, the 360 Condos, W Hotel and many others from this area. People come at night just to enjoy the Austin skyline from this area to watch the skycrapers buildings light up and reflect back into the waters nearby. Austin is fastest growing city in the US and is the Capital of Texas which has a population over 947,000 and continues to grow, it is 11th most populous city in the US and the fourth largest city in Texas. Austin is located in central texas at the beginng of the Texas HIll Country. Austin has many waterways including Lady Bird Lake in downtown, Barton Springs, McKinney Falls, Lake Austin, Colorado River, Lake Travis and many more in the hill country. Austin is a diverse city made up high tech workers, government employees, college students along with blue collar workers. Austin has a vibrant music community with it many night clubs with live music and Austin City Limit music hall, along with the many music event held in the parks around the throughout the year. Austin claims the title of Live Music Capital of the World of it rich history of live music from the day of the Armadillo Headquarters, to South by Southwest along with the many places you can go and listen to live music throughout the city. Posted in Photo of the Day and tagged 360 Condos, architecture, austin cityscape, Austin skyline, Austonian, buildings, city, downtown, Frost Bank, high-rises, Long Center, night, pano, panorama, panos, park, pool, Reflection, reflects, W Hotel on October 20, 2017 September 26, 2018 by Bee Creek Photo. Austin Bat Watch – This is an image from the Ladybird Hike and Bike trail of the anticipated bats coming out from under the Congress Bridge in Austin, with the crowds of people on the bridge and below all waiting for their nightly appearance. The lighting was very good this day with a nice reflection under the bridge along with some nice clouds and blue skies. These mexican freetail bats have made their home under the bridge for more than forty years and the estimated number is somewhere around 1.5 million of them. It is an amazing site to see. Posted in Photo of the Day and tagged Austin bats, austin cityscape, Austin skyline, beecreekphoto.com, boats, city, downtown Ann Richards Congress Ave. bridge, kayak, Lady Bird Lake, lifestyle, people, skyline, Tod Grubbs on October 19, 2017 September 25, 2018 by Bee Creek Photo. 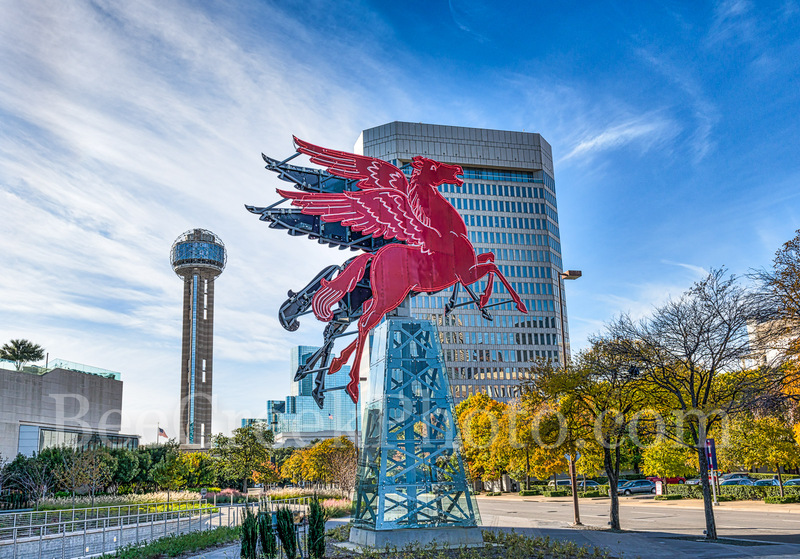 Flying Pegasus Dallas – This cityscape image of Dallas with the orginal Red Flying Neon Pegasus Horse sitting on top of an oil derrick which rotates for different views is now located at the Omni Hotel in downtown Dallas. In this image you can see the Reunion Tower and the Omni Hotel with the Red neon Pegasus sitting atop of an oil derick and rotating around so it can be viewed from any angle. This neon Pegasus had sat on top of the Magnolia building since the 1934 which was 29 floors high building and it had been like a beacon for all who lived in and travel to Dallas. The red pegasus was used as a symbol for the Magnolia Oil Company for many years till it became the Mobil Oil comapny. In the mean time this flying pegasus sitting a top of the Magnolia building has become an iconic landmark for the city for many years. In 1999 the orginal pegasus for taken down from the top of Magnolia building where it had sat since 1934 due to rust,corrosion and age over time need to come down. It was replace with a new pegasus. However, some in Dallas wanted to know what happen to the orginal Pegasus and began a search by a man name Jeremy McKane after a conversation with 82 year old June Mattingly who explain the importance of the flying horse symbol he was even more sure they needed to find it and see if it could be restored. McKane was recruited by Matthew Southwest to help provide the art for the Omni Hotel and after speaking with the vise president Jeff West of the company a common bond was form to find the Pegasus. McKain with the help of Jeff continue to talk to people and over a period of time the orginal flying pegasus was found in a city storage shed near White Rock. Jeff West got the finacing from his company to restore the project so with McKain and a group of artist and experts on restoration they were able to bring this landmark back to life on the lawn of the Omni Hotel for all to enjoy again. Posted in Photo of the Day and tagged Dallas, Dallas cityscape, downtown, flying horse, iconic, landmark, Maganolia Oil Company, Magnolia Hotel, neon, neon sign, oil derrick, Pegasus, red, red neon, symbol on October 18, 2017 September 25, 2018 by Bee Creek Photo. Dallas Cityscape View Pano – Dallas skyline panorama view of the city with both the Margaret Hunt Hill Bridge and the Margaret McDermott Bridge in the scene. Also in this image is the Reunion Tower, the Bank of America Plaza, Renaissance Tower, Comercia Bank Tower, Omin Hotel, along with many other downtown high rise buildings. Dallas has some of the tallest buildings in Texas second only to Houston. The Bank of America Plaza stands at 921 feet and the Renaissance Tower at 886 feet as two of the tallest buildings in the southern US. Dallas is also the fourth most populous city in Texas with an estimate of 1, 197 million, but the Dallas-Fort Worth metroplex has the greatest population in Texas at over 7 million for the 2016 census. Dallas is the main draw to the area with it modern city it has become a main area for coporate head quarters like AT&T, ExxonMobile, Nokia, Rockwell, and the list goes on for fortune 500 companies located in the area. Posted in Photo of the Day and tagged AT&T, Bank of America plaza, buildings, Comercia Bank Tower, corporate headquarters, Dallas cityscape, Dallas Skyline, Dallas-Fort Worth metroplex, downtown, ExxonMobile, Fortune 500, high rise, iconic, Margaret Hunt Hill Bridge, Margaret McDermott Bridge, modern, night, Omin Hotel, pano, panorama, Renaissance Tower, Reunion Tower, southern US, tallest, texas, view on October 17, 2017 September 25, 2018 by Bee Creek Photo. Dallas Skyline Reflections Pano – Dallas skyline reflections pano in downtown. This image of the Dallas Cityscape includes the Margaret Hunt Hill Bridge, the Reunion Tower, Bank of America, Renaissance Tower, and many more of the city’s high rises buildings This skyline reflects back into the waters of the Trinity river with the buildings and bridge along with those iconic skycrapers reflections in the water of the Trinity. Posted in Photo of the Day and tagged Dallas cityscape, Dallas Skyline, night, panorama, Reflection on October 16, 2017 September 25, 2018 by Bee Creek Photo. 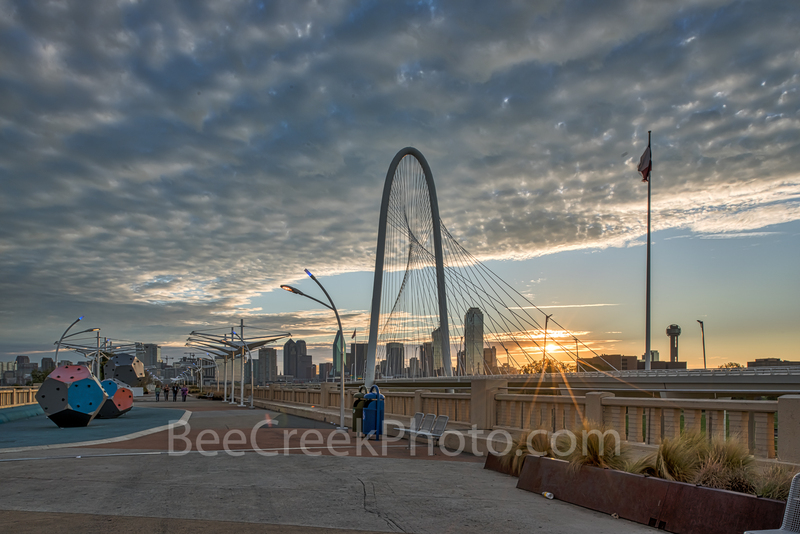 Dallas City Sunrise – We were calling it a day when we turned around on the Continental Avenue and saw this sunburst through the Margaret Hunt Hill Bridge when we decided to catch another image of the cityscape from this location. This city pedestrian bridge has been renamed as the Ron Kirk Avenue Bridge. Posted in Photo of the Day and tagged Continental bridge, Dallas bridge, Dallas city, Dallas cityscape, Dallas Skyline, Dallas sunrise, donwtown, landmark, Margaret Hunt Hill Bridge, pedestrian bridge, Ron Kirk Avenue bridge, skyline, sunrise, toursit on October 15, 2017 September 25, 2018 by Bee Creek Photo.